Learn how to knit fabulous socks in this informative, online knitting class taught by knitted sock expert, designer and shop owner Lisa Carnahan. Best of all, this knitting class will teach you the three most popular methods of making socks so that you can knit socks with the technique YOU like best! Everything you need to know to get started is right here in one knitting class -- the materials needed, construction of a sock and the three most popular technique options for knitting socks. 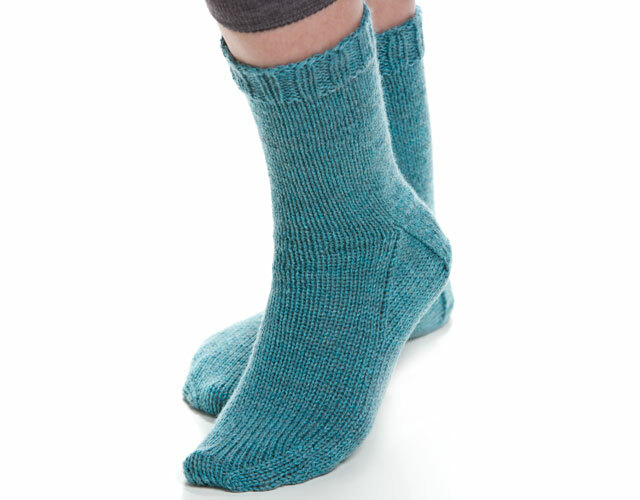 Plus, you'll get a unisex Stockinette stitch sock pattern with a heel flap and gusset shaping. The sock pattern has eight sizes so you can knit a pair for the entire family. You'll learn as you create, gaining knowledge about knitting methods that include working the sock on double pointed needles, two circular needles and one long circular needle. Get acquainted with the right yarns to select, different notions that can be used, demonstrations of knitting in the round, constructing the cuff, leg, heel, foot and toe, casting on stitches. You will get expert advice on working the heel flap, explanations of short rows and shaping and finishing the toe. This knitting class will be suitable for someone with basic knowledge of knitting, including casting on, the knit stitch and the purl stitch.